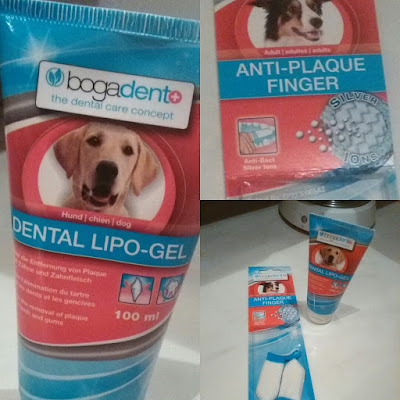 A while ago, I bought some new dental care gel and foam and I promissed to make an update on it. I have been using the teethgel and foam in the first period for nearly every day, the youngsters got their foam, and the adults the gel. I must say it worked, really, teeth where clean and there was not new tartar and stuff building on their teeth, so that was positive. But, there is a but, I'm sorry, my dogs stomachs did not react great on the cleangel. That was a big shame because I really loved it that I didn't have to brush so regularly their teeth. And I do know that, that is a lazy thing, but when teeth are white and shiny and I don't have to brush that much I get happy! So now I use it once a week, and it works ok, but when I finish the bottles I don't think I will buy it again, not because of the product but purely because of my dogs getting not totally well. And I don't like it when my doggies get diarrhea after their teeth being done. If your dogs have a better stomach then my collies it is totally worth trying, and it is not terribly expensive. In the meantime I'm trying a new product, because I'm still in search for a new great product now they have discontinued my favorite teeth cleansing product. My newest is a gel from Bogadent, so now I will try this for a few months and see what happens next. I will keep you updated on it!!! !